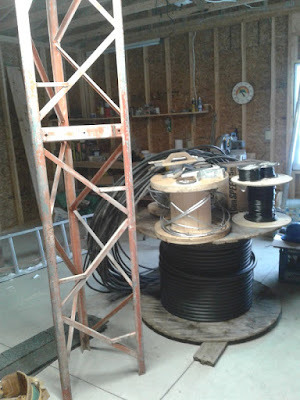 Antennas and feed lines on the 150' tower were finished just in time. Since then the weather has turned very cold and snowy. Several winter projects have had to be delayed, and some are likely to be cancelled. Temperatures have plummetted far below normal for even this climate, with frost penetrating the ground sooner than expected. The weather forecast shows no relief until at least the beginning of January. Work in this weather is uncomfortable and unsafe. One important job that I had to put off was to rent a trench digging machine. It is now very likely that feed lines and cables to the big tower and in other areas will have to stay above ground until spring. The machine does not handle snow very well and there is a potential for mishaps due to freezing in the top level of soil. This is not so bad were it not for the deer. I worry that they'll step on the Heliax. So far the few I've seen have stayed on the other side of the tower. I am fortunate that they haven't tangled their hooves in the 160 meter antenna radials. I have begun work on the 80 meter vertical array. Now progress is stalled due to the weather. Working fast when the temperature happened to rise above freezing I planted the base for the driven element (tower) and the three screw-in guy anchors. When (if) the weather moderates I'll get back to work on it. 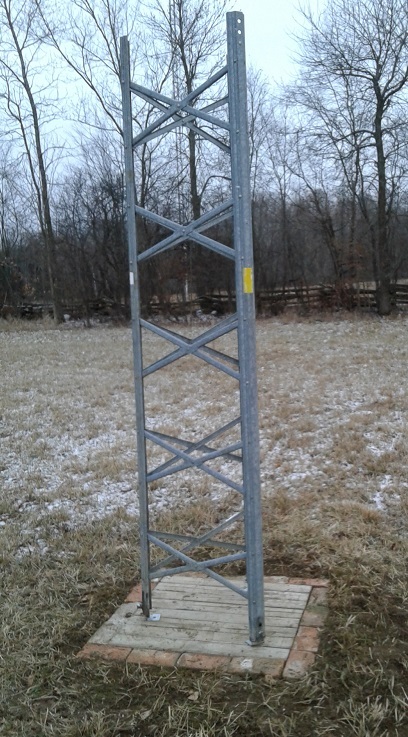 My minimum objective this winter is to have it working as a simple omni-directional vertical. The array has been redesigned from what I originally intended for a variety of practical reasons. Once the model has stabilized I'll write an article on it, following by another on the actual construction. Indications are that I can achieve improved performance, and better assess how it compares against the more commonly-used 4-square array. Additional Beverage antennas for the low bands have been roughly surveyed. There are numerous practical considerations on their placement, topology and switching which I am gradually working through, along with research on how others have addressed similar issues. I hope to make progress on all of these over the winter, though that is difficult to plan at this point. Weather determines the pace of outwork work for the next few months. There are many projects I have planned and can do indoors over the winter. Building a competitive station is more than towers and antennas. Here are a few I have on my plan. 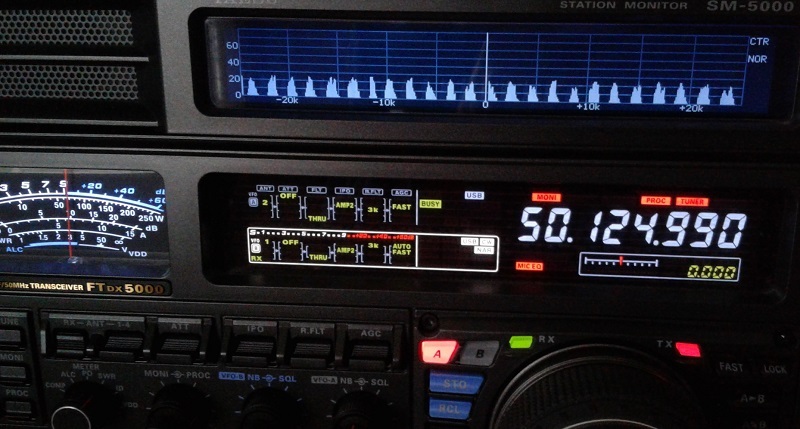 Fully integrate the FTdx5000 with the PC. With the ancient laptop gone I expect few difficulties connecting the SCU17 interface to get audio, spectrum and CAT from a single USB connection. With this in hand there is more I can do with contest software and to experiment with digital modes. Arduino kit to prototype station control hardware and software. My first project will be a direction indicator for the prop pitch rotator, followed by much more. Some of this will be purely experimental, with only the most useful devices promoted to actual equipment. I want more automation and software control in my contest station. The choice of prototyping technology does not dictate that the final version will be Arduino. SO2R and multi-op contesting requires a variety of audio, switching and rig control systems. Most I do not yet have. Winter is an excellent time to review options and experiment. Ergonomics at my operating position leave much to be desired. I am experimenting with different arrangements of rigs, computer, chair, desk and accessories to make operating more pleasurable and contests more endurable. Articles on these will follow as and when they significantly progress. I also intend to experiment with other things such as digital modes, if only to play around and see what others are getting excited about. Although I don't expect to become a digital modes enthusiast the technology intrigues me. Perhaps this is because I have experience developing DSP software and coming up with tactics for dealing with poor SNR. With more of my store of tower, cable and related hardware installed out in the field there is more room in my garage workshop. Amazingly I still have well over 1,000' of Heliax and perhaps 200' of large diameter aluminum tubing and pipe in there! The unheated garage is not terribly comfortable for winter work. The thermometer on the back wall reads -10° C, and it's only 2° colder outside. On the other hand there's no wind chill. Despite the conditions in there I am arranging the space to permit a few construction projects to proceed over the winter. One example is a section of LR20 tower that I picked up this fall. 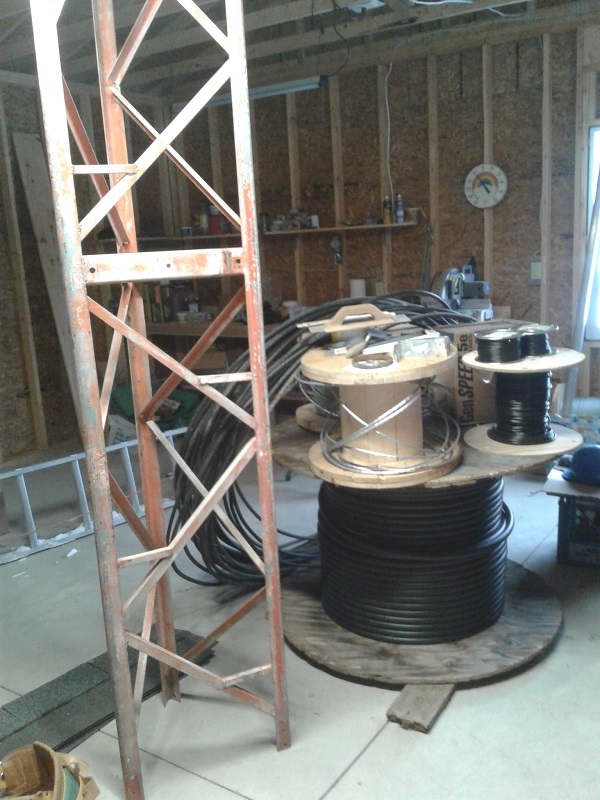 It will serve as a jig for construction of side mount hardware and other attachments for the 150' tower. This is far more convenient and safer than working on the actual tower. Unlike self-supporting tapered towers every LR20 section is essentially identical. Ever since I moved in I have been tracking down noise sources to ensure the best possible receive conditions. The problem is not acute for the present but could be once I return to QRO operating and have to deal with many more weak replies during contests. Despite being far from neighbours I am not free from noise. Some of it comes from within my own house. One persistent problem is noise from the many computers, interconnect cables and unshielded Cat5e cable to the terrestrial wireless antenna that is my sole source of internet access. The noise is greatly reduced for the antennas on the big tower since they're farther from the house. Depending on the weather power line noise in the southwest direction can be S9 on the high bands through 6 meters. The noise blanker can mostly deal with it though not without distortion when signals are present, and inter-modulation under contest conditions. There are a couple of power line noise sources in a couple of other directions that are not problems since they appear to be quite far away. The local utility has come by to discuss the issue and plans to return in January to track it down. They have been very responsive and appear interested in getting it fixed. As is often the case it can be difficult to resolve since the noise appearance is not sufficiently predictable and the utility works to a schedule. If all else fails I'll rig up a portable sniffer so that I can help locate the source. It helps being in a sparsely populated rural area where the number of potential sources is small. Aside from noise I am beginning to fret about what antennas to put up next year. This will require careful planning before I can begin design and construction. My ongoing experience with the antennas I have is proving very helpful to determining where the need is greatest. I plan an article to report on how the current complement of antennas is playing. Come January I will make an attempt to finalize my station construction plans for 2018. Many yagis are certain to be in my construction plan, and one more big tower is possible. I'll try to be more realistic in my objectives than I was for 2017. It's the dependencies on weather and assistance that most imperil any plans I can come up with since those are often outside my control. Expect an article later in January as I do my traditional of the year that was and look forward to the coming year. In this climate winter serves as a bookend to both seasons. Enjoy the holidays wherever you are. From today onward the days get longer in the northern hemisphere so spring can't be too far off. As time permits expect at least one more article before year end.